This luxury 6 night safari visits two camps renownded for their excellent predator sightings. 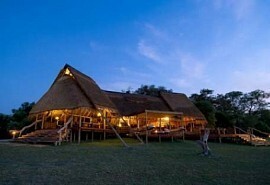 Guests will search for predators in the southern Okavango Delta as well as big game on the Savuti Channel Linyanti. The focus will be on game drives and night drives with optional bush walks. Guests will be accompanied by expert guides who will create a better understanding of the African bush adding infinite value to the experience. On arrival at Maun airport, guests will be met by a representative and assisted to their light air transfer to Chitabe Camp where they will be staying for 3 nights on a fully inclusive basis plus game viewing activities. 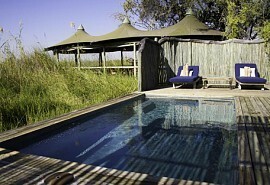 Activities include guided walks and game drives and night drives. 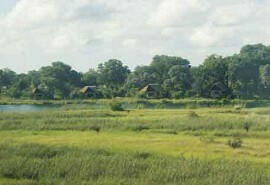 Chitabe Camp is situated on a beautiful island in a 28 000 hectare picturesque reserve next to the Moremi Game Reserve. The area around Chitabe offers an abundance of wildlife including elephant, buffalo, lion, leopard, cheetah, giraffe, zebra, tsessebe and impala. Wild dogs are also occasionally sighted. After breakfast and morning activities, guests are transferred by light aircraft to Savuti Camp for 3 nights on a fully inclusive basis plus game viewing activities. Activities at Savuti Camp include game drives, night drives and walking safaris. 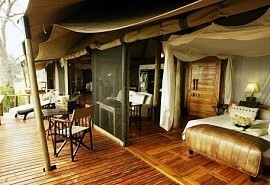 Savuti Camp offers 7 comfortable walk-in safari style-tents with ensuite facilities and outdoor showers. The area around Savuti offers high wildlife concentrations, especially during the winter months. Apart from the normal plains game, the area has good sightings of roan, sable and giraffe. All the predators occur in the area, including wild dog.